Countries, like people, have creation stories. They are what we choose to believe are our origins. For us as individuals we have personal stories that we create. They might be part of a family story that we were told and have amended to fit our lives. They give us meaning and an identity. If you think you don’t have a story, well, that’s a story too. There is always a story whether we are aware of it or not. Countries have stories that their inhabitants collectively create. But what is a country? It only really exists in the collective heads of its inhabitants. As do its creation stories. People in the United States have all heard the story of the Mayflower and the ‘Pilgrim Fathers’. It is one of the primary creation myths of that country. 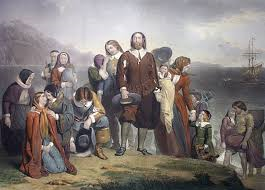 A ship carrying 102 English Puritans fleeing from religious persecution sailed from Plymouth, England in 1620 and landed in what is now the state of Massachusetts. They were pious hard working people looking for religious freedom and a better life. Their survival of the first winter they experienced in North America is still celebrated every year in November on Thanksgiving Day. There are many Americans who can count an ancestor who was a passenger on that ship. I have read estimates that there are between 20 and 30 million living Americans who can do that. This is all the more amazing when you think there were only 102 Pilgrims on the Mayflower and only 48 of them had children. 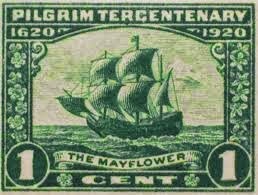 One of the Mayflower passengers was Stephen Hopkins (1581-1644) who was my G G G G G G G G G Grandfather. Stephen Hopkins was a bit different from the other Puritans fathers in that he wasn’t a puritan and he wasn’t particularly religious at all. He was a shopkeeper and clerk and was looking for a better life. Historians now believe he had been to North America before. 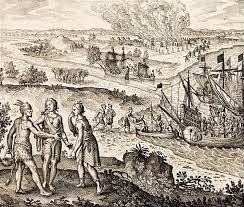 In 1607 three ships chartered by the Virginia Company sailed up Chesapeake Bay, landed in present day Virginia and founded the first permanent English colony in North America. This was 13 years before the Mayflower. Stephen Hopkins, it is now believed, arrived in Jamestown, Virginia in 1610 on the ship Sea Venture having left his wife and children behind in England. The Jamestown Virginia settlement was completely different from the Massachusetts settlement. It was started by a chartered company who sent out colonists to make money for them. The colonists themselves were there to get rich. They weren’t interested in farming, they wanted to find gold or some other precious commodity. As a result the early years of the colony were marked by fights with the ‘Indians’, fights between themselves and starvation. Excavations have found human teeth marks on some of the colonist’s bones. There was no Thanksgiving Day in Jamestown, at least not in the early years, It would be more appropriate to have a Cannibalism Day or Greed Day. Not a great creation story for a nation. Stephen Hopkins arrived in 1610 and returned to England in 1614 when he received news that his wife had died. 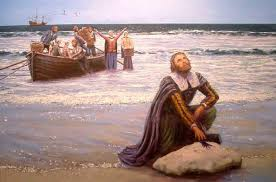 He remarried and returned to the new world on the Mayflower with his new wife, one of his sons two daughters and a servant. Stephen would have been an invaluable companion for the Pilgrims as he had experience of America and its native people. He would have thought he was going back to Virginia as this was the Pilgrims intention. Once the Mayflower had arrived in Massachusetts circumstances prevented it going further. I wonder what we would be eating on Thanksgiving Day if they had made it to Virginia. Stephen Hopkins initial journey to Virginia in 1609 was an interesting one. The ship he was on (‘Sea Venture’) was sunk in a storm and he ended up a castaway on the island of Bermuda along with 150 other passengers and crew. An account of this shipwreck was written by William Strachey, True Reportory of the Wrack, and Redemption of Sir Thomas Gates Knight, and is thought to be one of the primary sources that William Shakespeare used when writing his play ‘The Tempest’ which was first presented in November 1610. There is a character in ‘The Tempest’ who is said to be based on Stephen Hopkins. As I understand it, this is because the play is about a quarrelsome group of castaways and Stephen was the most quarrelsome of them all. In fact he was such a complainer that at one point he was charged with mutiny and narrowly avoided being executed. 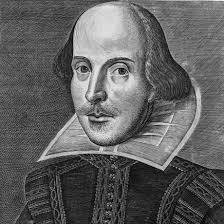 I don’t know how much of his character would have been used in Shakespeare’s play other than this. The survivors on Bermuda eventually managed to put aside their differences enough to build a couple of ships and set sail for Jamestown, Virginia in May 1610. 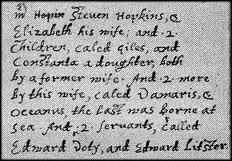 Interestingly, on Stephen Hopkins return journey to North America on the Mayflower he came with his second wife Elizabeth, his son Giles Hopkins and with a servant Edward Doty (abt 1599-1655). Edward Doty is also an ancestor of mine although on my father’s side of my tree. I also have 3 other ancestors who were on the Mayflower and one of them appears twice in my tree (my parents are cousins). If you count the other 7 children of the 6 ancestors I have who were on the Mayflower, there hasn’t been another such large group of people from my family tree on one boat ever. (unless you count a trip we did with Uncle Joe to Monhegan Island in the summer of 1972). But this is true for a lot of Americans. Stephen Hopkins owned a tavern in Plymouth and often was in conflict with the Pilgrim elders. He let “men drink in his house upon the Lords day” and was fined “for suffering servants and others to sit drinking in his house” (contrary to Court orders) and “for selling wine, beere, strong waters, and nutmeggs at excessiue rates”, among other things. He died in 1644. 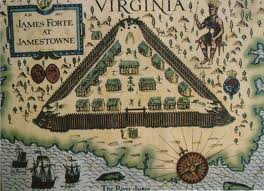 The Jamestown settlement, after shipping back to England a load of iron pyrite (Fools Gold), was only saved economically by a settler named John Rolfe who tried planting some tobacco seeds he had found on the island of Bermuda. This started Virginia’s most profitable agricultural industry. We’re all still living with the consequences of that. So which story do we choose for our origins, a story of rapacious wastrels who are trying to increase their material wealth or a story of people looking for toleration and spiritual freedom? In a sense they are both stories of people looking for a better life. They are both part of our human story. In a sense they are both stories that we can find within our individual selves. As adults we see through the gilded stories we were told as children and understand the gritty/ dirty reality of life and human motivation. We think it ‘realistic’ but aren’t we just creating another story? A story more detailed perhaps, more ‘realistic’ but nonetheless just another story. Could we also say this is just as true of our personal life story? Which creation myth have you chosen? DO YOU HAVE MORMON ANCESTORS?